Lily Owsley scored twice on her 50th appearance for Great Britain as the Olympic champions beat the United States 3-1 in the FIH Pro League. Mackenzie Allessie opened the scoring for the hosts in Pennsylvania but Owsley pulled GB level just five minutes later. Emily Defroand gave Mark Hager's side the lead with her first international goal, with Owsley providing the assist. Owsley then wrapped up victory with her second goal from a penalty corner. 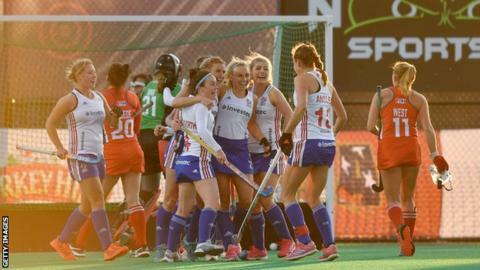 The victory was GB's first in the competition, following defeats by New Zealand and Australia and a draw with China - though they claimed a bonus point in the latter by winning the shootout. "To win is unbelievable," said Owsley, who took her tally to 12 goals for GB. "It's been a long time coming and it means the world to us to get three points. "It's been a tough journey, a tough transition since the World Cup, and I feel exhilarated and relieved." GB's next FIH Pro League fixture is against Argentina in Rosario on 6 April. Join more than 100,000 people across the UK and choose to play hockey outdoors or indoors.